How exciting for you and what a great pattern. Congratulations! Thanks! So glad you kept trying!! These socks are amazing! I cannot wait to start knitting them!!!! Love the sock! I need to add it to my list. 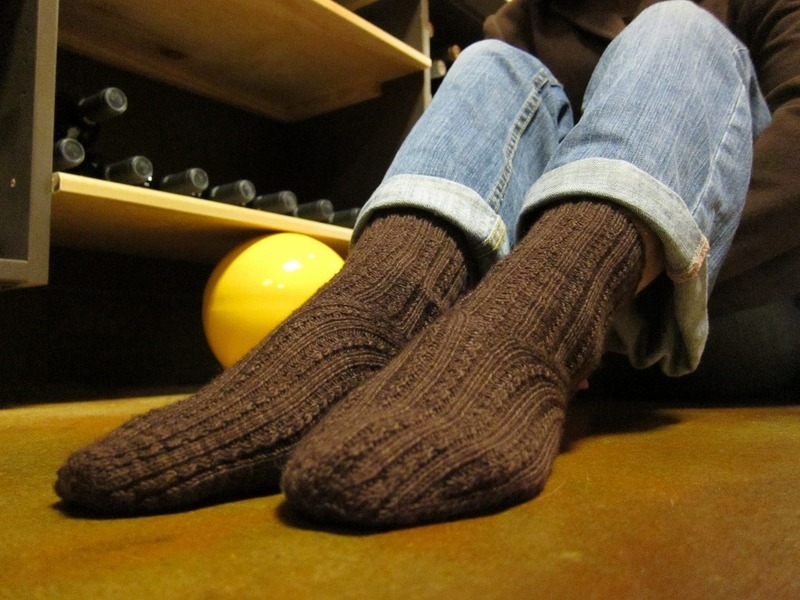 Nice socks, and I have just the yarn for them…. I found your blog through the Knitty pattern (and found that because a friend sent me a link to a different Knitty pattern). I cannot wait to try these socks. 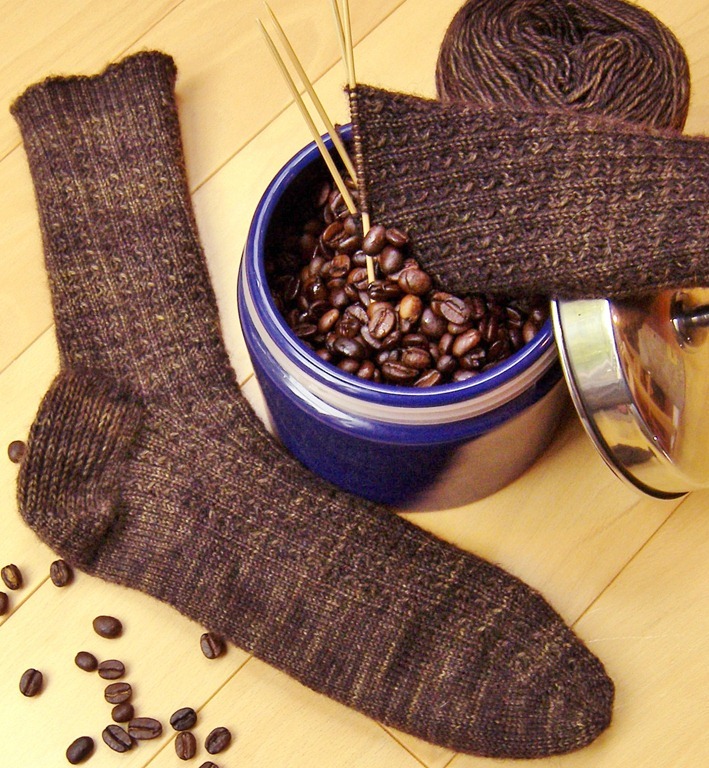 I do not have any brown sock yarn at home (and I’m not a coffee drinker), but I do have some dark brown/beige/offwhite variegated — so I’m thinking I can call mine “tea leaves”??? 😉 I think that I’m feeling a bit feverish and should probably go home and lie down on the couch with a cuppa’ and my knitting needles . . . don’t you think!?!?! I cannot wait to try your technique . . . Thank you so much for sharing!!! congrats! That is a great pattern! 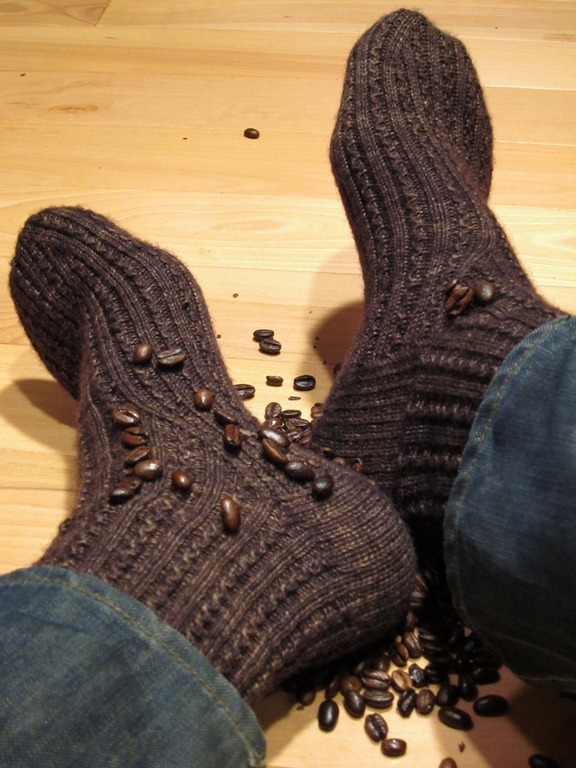 I have yet to try socks as I’m afraid I will join in with the other 95% of the knitting world in the obsession with them… that said.. Java may just be the first socks I knit. They look wonderful- love the ribbing. 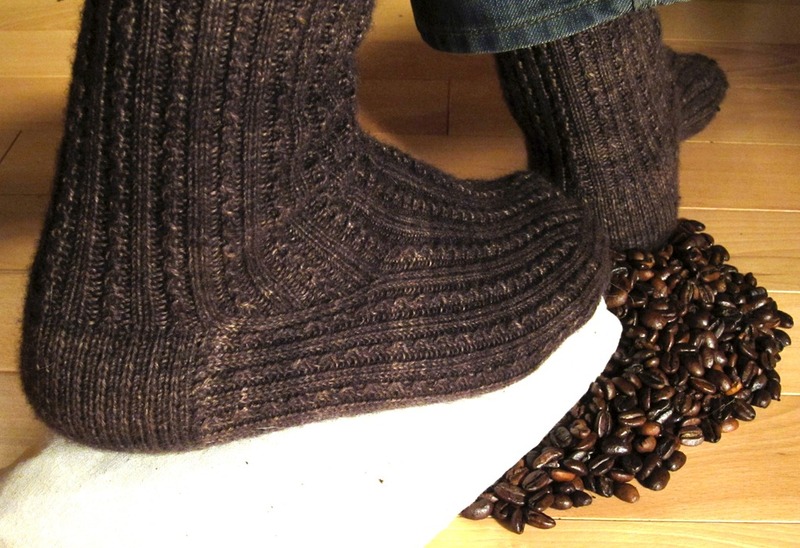 Man, those look like comfy warm socks. It’s going to hit -30 degrees in MN tonight, which means I’ll be bringing a hot water bottle to bed tonight to keep my feet warm. 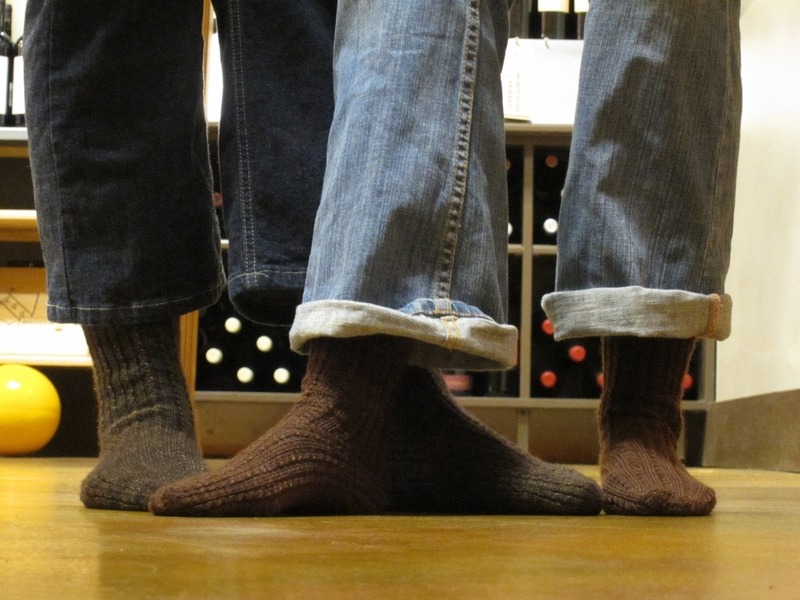 No doubt socks like yours would be more effective and stylish! I saw your pattern in “Knitty” wow!! congratulations!! 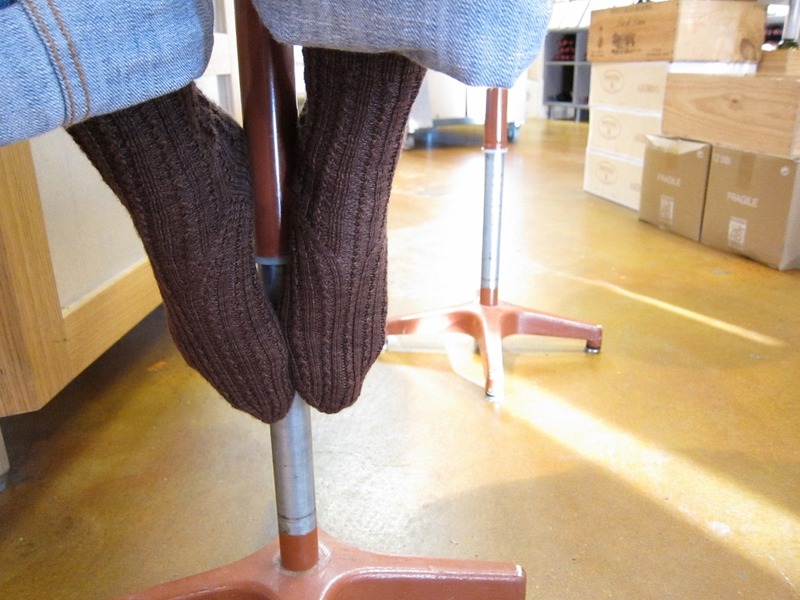 I love those socks, they’re on my Ravlery “to-do” list, thanks for sharing! Congratulations on your sock pattern being published. 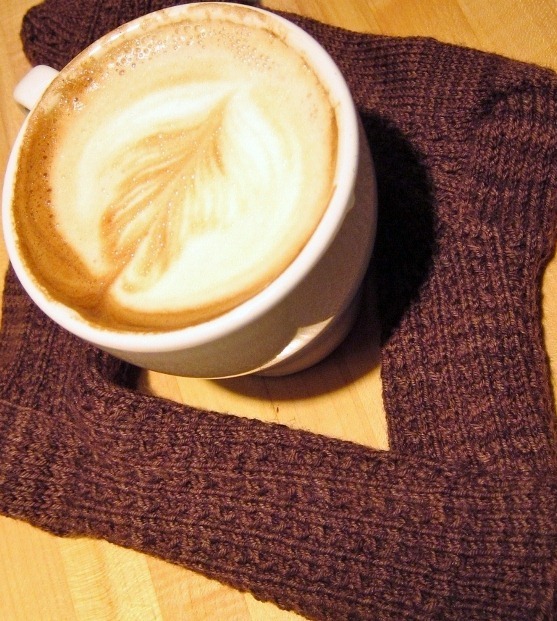 I’m looking forward to knitting Java when I find the right yarn for it. Your English is great! I’m glad you like the pattern, and believe me, I’m glad they got in Knitty too! I’m halfway through knitting these for my FIL, and love the pattern. My husband wants some too! Nice! I designed them to be male-friendly, but it’s great to hear that men actually want them! I love these socks!!! and I love the description… enough to keep you awake not enough to make you jittery. 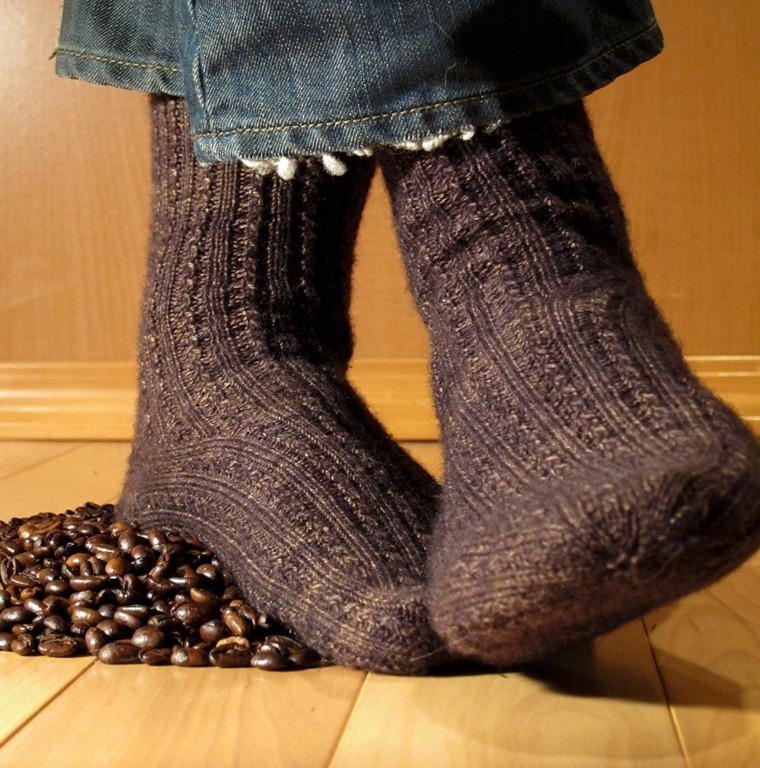 I’m very, very picky about my sock patterns, but I’m totally putting these in my queue! Thanks! I hope you enjoy knitting them! 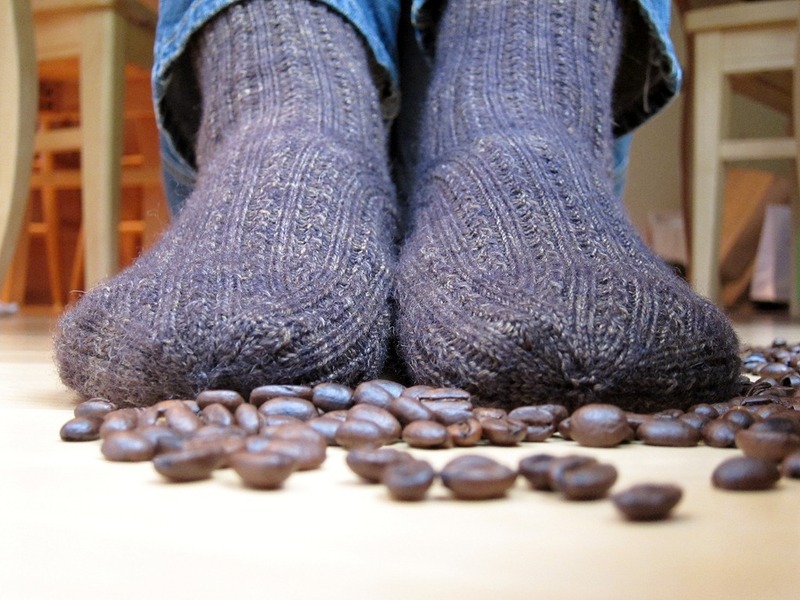 Congratulations on the Java socks – they are gorgeous. I did love them at first glance in January – but have just re-visited them after Manic Purl’s podcast on the Winter Knitty. Now they are in my queue. And I’m a coffee addict – but I could give it up at any time (yeah, right). Oh yeah, I could totally give up coffee too. Totally. Thanks for pointing me towards the Manic Purl podcasts- I love listening to podcasts while I knit! 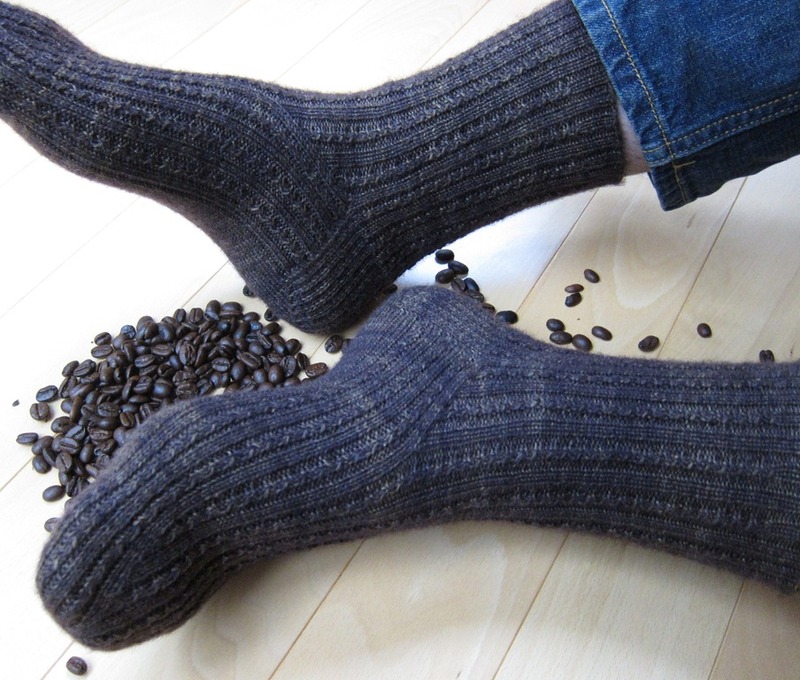 Hi Cailyn, I just finished my first pair of socks – your gorgeous Java pattern. These socks were knitted in rooms, in cars, on planes from Perth to Canberra, the Gold Coast, Darwin, Truscott and Broome (all over Australia basically)! I knitted them for my boyfriend and learnt so much in the process. The first sock took 2 months, the second merely 2 weeks! Thanks for introducing me to knitting socks – I am now officially addicted. Glad I could get you hooked! Be careful- you’ll end up with a lot of sock yarn in your stash, but it’s all so pretty, who cares? Hi Cailyn! 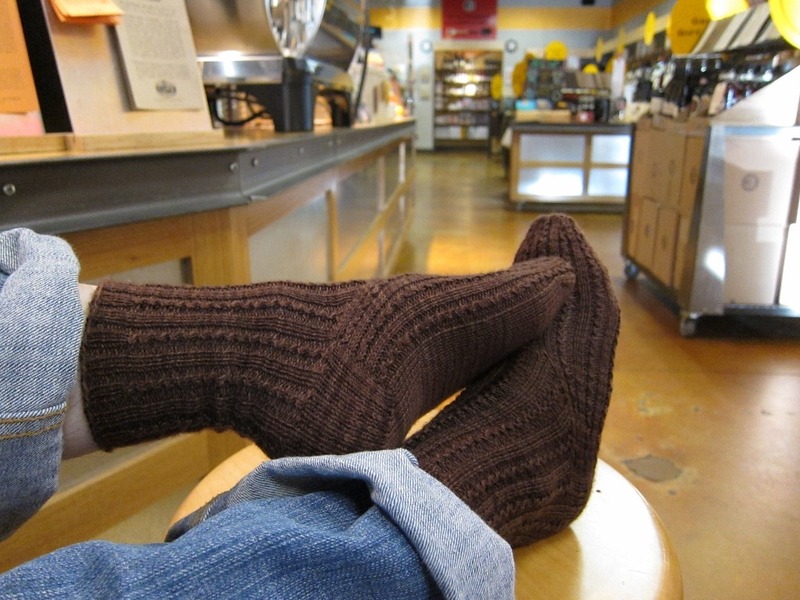 I’m planning to knit Java socks for my DH using GoodReader on my iPad to manage the pattern. By any chance do you have a version of the charts available in one piece each instead of three? On the iPad I can scroll and enlarge sections, so it would be more workable with one chart, although in the days of paper (i.e., last month) you totally would have had me at “ScotchTape”. It’s funny how sometimes things were easier with paper! I will email you to follow up on this- although I wish I could use GoodReader on my Android! Sigh.